There is no better place to spend Presidents’ Day weekend than in Washington, DC, the place where it all began. The original version of the holiday was in commemoration of George Washington’s birthday. George Washington was born on February 22, 1732. Washington’s birthday was not only celebrated during his lifetime but also before he was president. Without George Washington’s generalship there may never have been a presidency. It was during this time, in the midst of the Revolutionary War in 1780, when his birthday was first honored by the Virginia Gazette. From that time on the celebrations multiplied so quickly that before the year of Washington’s death in 1799, there was no town too small to hold a ball or banquet in his honor. After his death, the celebrations continued as a way to remember and celebrate his life and its enormous impact on America’s independence. By the early 19th century, Washington’s Birthday had taken firm root in American culture as a bonafide federal holiday. Some of the traditions included Birthnight Balls in various regions, speeches and receptions given by prominent public figures and a lot of revelry in taverns throughout the land. Then along came Abraham Lincoln, another revered president with a February 12th birthday. The first formal observance of Lincoln’s birthday took place in 1865, the year after his assassination, when both houses of Congress gathered for a memorial address. While Lincoln’s Birthday did not become a federal holiday like George Washington’s birthday, it did become a legal holiday in several states. Until 1971, both February 12 and February 22 were observed as federal public holidays to honor the birthdays of Abraham Lincoln and George Washington. In 1971, President Richard Nixon proclaimed one single federal public holiday, Presidents’ Day, to be observed on the third Monday of February, honoring all past presidents of the United States. 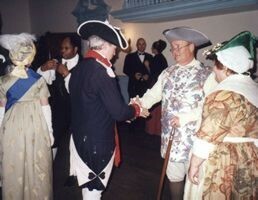 Till this day, George Washington’s Birthnight Ball is held in Alexandria, Virginia at Gadsby’s Tavern Museum. In the tradition of the 18th century, Gadsby’s recreates several balls each year. The Birthnight Ball is generally held the Saturday night before Presidents’ Day. The Birthnight Ball is a celebration of George Washington’s birthday and his contributions to our country. 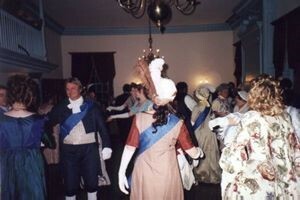 The ball is complete with toasts, a formal dinner, a historical program and George Washington’s favorite 18th century dances. The dances are led by a dancing master who calls the dances and sets the pace. The dances are performed by all of the guests at the same time. The couples form lines and each couple dances up and down the line, exchanging pleasantries, until each couple has returned to the beginning of the line. Gadsby’s Tavern is one of the few 18th century taverns remaining in the United States. Travelers have been coming to the tavern since the mid 1770s. During Washington’s time, Gadsby’s was a center of political, business and social life in early Alexandria. The tavern was the setting for dances, theatrical performances and meetings of local organizations. George Washington enjoyed the hospitality provided here and attended the annual Birthnight Ball held in his honor in 1798 and 1799. Other prominent guests of Gadsby’s included John Adams, James Madison and Thomas Jefferson. In fact, Thomas Jefferson held his first inaugural dinner at the tavern on March 14, 1801. Gadsby’s diverse past is representative of the many ways in which taverns served their communities in the 18th century. In an age without restaurants, convention centers, auditoriums and even theaters in many places, taverns provided the functions of these and more. Above all, a tavern was a public house intended to be used by the public for a variety of activities and was as common a sight in colonial villages as a church or courthouse. On Presidents’ Day, Gadsby’s offers complimentary tours and the city of Alexandria hosts the world’s largest Presidents’ Day Parade. 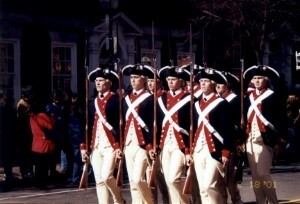 Spirited marching bands, Revolutionary and Civil War reenactments, as well as military and specialty units anchor the traditional two-hour spectacle along the streets of Alexandria. Over one hundred units participate in the parade, some of which include Sons of the Confederate Veterans, Daughters of the American Revolution, Living History Foundation, the Seventeenth Virginia Infantry and of course special appearances by George Washington and Abraham Lincoln! 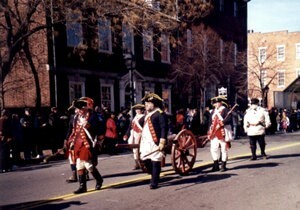 The highlight of the parade was during the war reenactments, when the soldiers exploded an authentic cannon! A trip to the Washington DC area is not complete without a visit to the National Zoo. The 163 acre Smithsonian National Zoological Park is home to more than 5,800 species of animals, including mammals, birds, reptiles, amphibians, fish and invertebrates. The zoo has created amazing natural habitats such as Amazonia, a re-creation of a tropical rainforest and river. Here you’ll see monkeys up close and personal. If you take a moment to look in the surrounding trees, you may see them, as they generally are not kept in cages. The newest habitat is that of the zoo’s new giant pandas. Its seems the whole world wants a glimpse of Tian Tian and Mei Xiang and with good reason as the two giant pandas are enchanting. 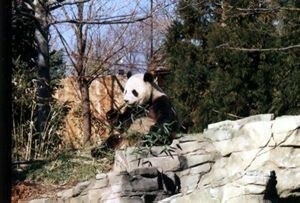 Tian Tian treated everyone to some unbelievable views as he wandered up to the front of the exhibit to dine on the bamboo stalks strategically placed in the front of each outdoor habitat. There are only about 1,100 giant pandas living in China’s wild today. The National Zoo makes a great family outing and admission is free. Gadsby’s Tavern Museum is located at 134 North Royal Street, Alexandria, Virginia. By subway, take the Blue or Yellow Line to the King Street station. For more information, call (703) 838-4242. The National Zoo is located at 3001 Connecticut Avenue in Northwest Washington, DC. By subway, take the Red Line to the Woodley Park/Zoo or Cleveland Park station. For more information, call (202) 673-4717.